Just got home and a couple of initial impressions. Hard to agree with these...it's a scrimmage. No continuity at QB. McCloud and Battle looked good at times, but not so much at others - but still good overall. Barnett was good overall. I'd agree with another that said we may be better in our QB future than last spring game. Defense is restrained, offense is not. McCloud and Battle looked significantly better than Kean or Oladokun did in the last 2 spring games. TAMPA, APRIL 13, 2019 – Fans packing Corbett Stadium got a good glimpse of just how explosive new coordinator Kerwin Bell's offense can be during the USF Spring Game presented by USF Federal Credit Union on Saturday afternoon. Starting quarterback Blake Barnett (Corona, Calif.) set the tone in electric fashion by throwing a 75-yard touchdown pass to all-conference tight end Mitchell Wilcox on the very first play. By the final whistle, USF's offense sported a lot of smiles after producing five touchdowns and two field goals in a 73-36 victory over the defense, which was limited by spring practice rules. "I just feel like we've got a lot of momentum coming from this spring camp and I think we're going to take that into the fall," said Wilcox, a senior from Tarpon Springs, Fla., who led all receivers with 90 yards on two catches. Saturday's scoring system featured normal point totals for touchdowns and field goals on top of two points being awarded for 15-plus yard plays and one point for fourth-down conversions. Defensively, three-and-outs counted for three points, turnovers counted for four and fourth-down stops earned the Bulls one point. "I like the way the offense just came out. 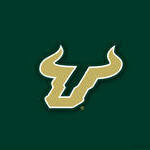 They were able to operate," head coach Charlie Strongsaid. "Defensively with the scoring system, defensive guys got mad at me because I took away the sacks and tackles for loss, which could have added more points to the score." 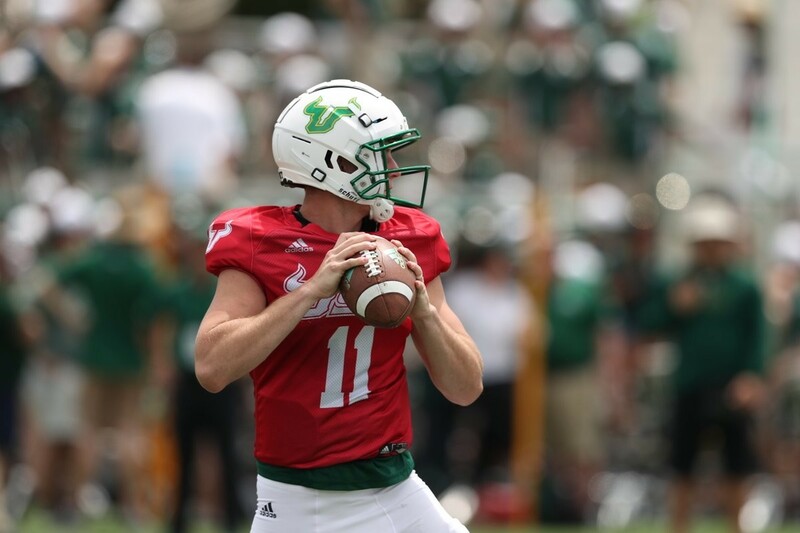 USF's offense was certainly happy with the result after producing what would have been 41 points in a real game situation as all three quarterbacks threw at least one touchdown and combined for 509 passing yards. Seven went on the scoreboard quickly thanks to innovative Bell cooking up a new play that got Wilcox wide open in the middle of the field during his 75-yard touchdown reception. Barnett was quick to spot Wilcox downfield on the play and went on to cover 135 total yards on eight completions during his limited outing. "That was all the brains, I just finished the deal," said Wilcox of Bell's big play idea. 1. Pace isn’t paramount for this offense. Whereas Gilbert orchestrated a breakneck, Baylor-style tempo, Bell will turn the tempo down a notch. The Bulls didn’t huddle Saturday, but they didn’t sprint to the line of scrimmage after every dead-ball whistle, either. Bear in mind, the players still are learning what Barnett has called a “very complex” offense, which also may account for the measured pace. 2. No QB quandary exists this year. 3. Senior Greg Reaves again is living on the edge. 4. The refurbished offensive line still needs work. 5. Keep the optimism and/or pessimism in check.